As a knitter, I’m somebody who likes to plan ahead. I knit numerous swatches; I try out new techniques and compare them with firm favourites; I take gauge measurements; I sketch and calculate. I knit up accordingly. This doesn’t mean I always get it right, but that’s okay. I will have learnt something new, and I can use that knowledge when planning the next thing. But in the last couple of years or so, I have been exposed to other methods of working. A more carefree and let’s-see-what-happens approach. A good example, and great inspiration, is the work by Rachael Matthews who runs Prick Your Finger. 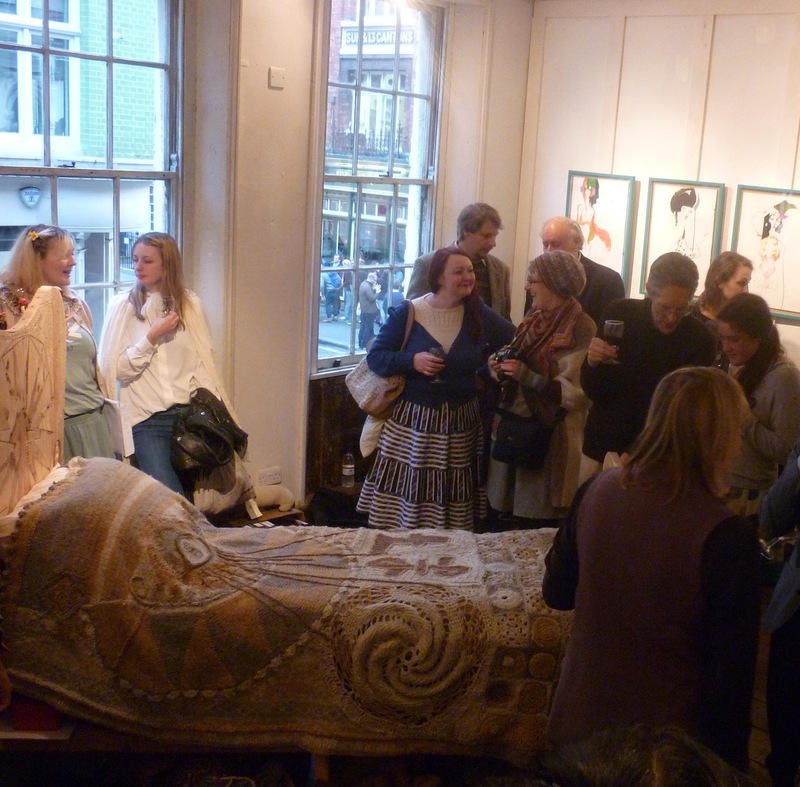 Rachael’s Shamanic Bed for Creatives contains a cornucopia of textile techniques. Hand knitting, machine knitting, crochet, darning, and who knows what else, all find their way into the shamanic bedspread. Ideas come into her head and these magically flow into her hands and make a fabric, as she comes up with them. Some of these will work, and others will not. Knitting and crocheting allows one to shape the fabric while making it, this in contrast to woven fabrics, where one has to cut and sew to shape it. In addition, knitting and crocheting can easily be undone without loss of material. It is possible to use the ripped out yarn and try again. So if an idea doesn’t work, then it’s a lesson learnt that can be put to use straightaway. It’s even possible to start something without knowing what the end result will be, like Rachael’s Explosion Jumper. I find this way of working, when it comes to knitting, quite a challenge. With decorational techniques (for want of a better description) I struggle less with this approach. 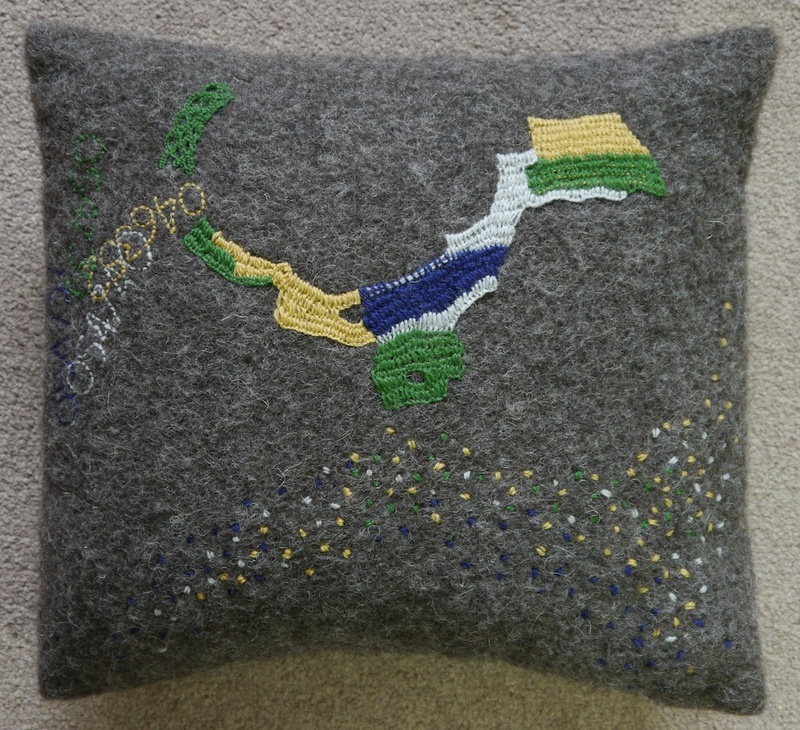 For instance, the embroidery on the cushion cover pictured above was done free-style, without any planning whatsoever. Those of you who follow me on Instagram (@tomofholland) will have seen the doodles I occasionally post. Embroidering this cushion was like doodling with needle and thread. Slowly but surely, I’m opening up to allow my knitting also to be more free-style, and less planned. It’s a shift in thinking that wakes me up, and it allows me to use my knowledge of techniques in a different way. It started with a simple bath mat. 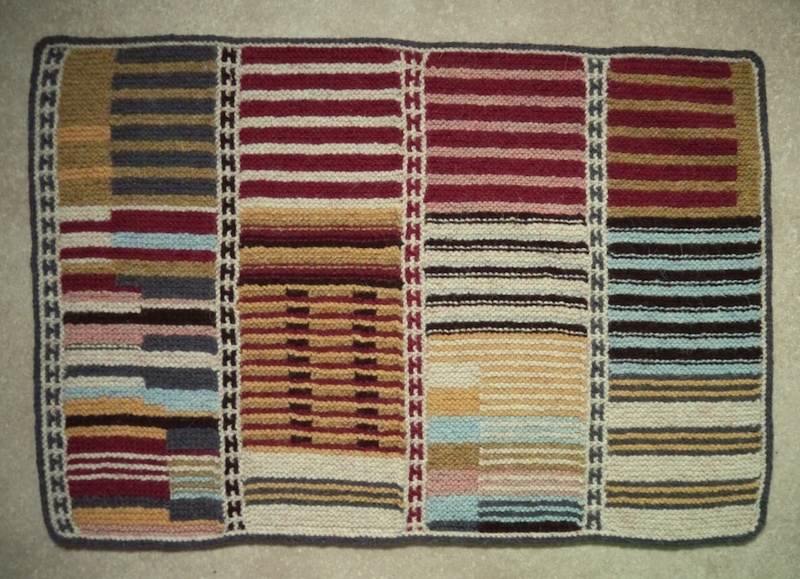 Having worked with Sue Craig on the Knitting The Map project (more on that in a later blog post), I had developed an obsession with stripes in garterstitch. Rachael selected eight shades for me from Prick Your Finger’s carpet yarn range, reminiscent of Bauhaus colours. Although I had made a lot of doodles (none of them larger than approximately 4 x 7cm), I didn’t plan anything before casting on. Yes, I knitted a swatch to select the right needle size for the fabric I wanted, but after that I just started at one corner and came up with the patterns and colours as I went along. I only decided on the construction after knitting the bottom strip. It was a departure of the planned object, the self-imposed constrictions and the letting go of expectations. These are just some of my books in my craft library in which the author in some way or other speaks about, or shows, how to let go of the regimented way of working, but instead letting materials or techniques guide the way. The compendium by Ann Sutton is a showcase of British textile artists working with a huge variety of techniques. 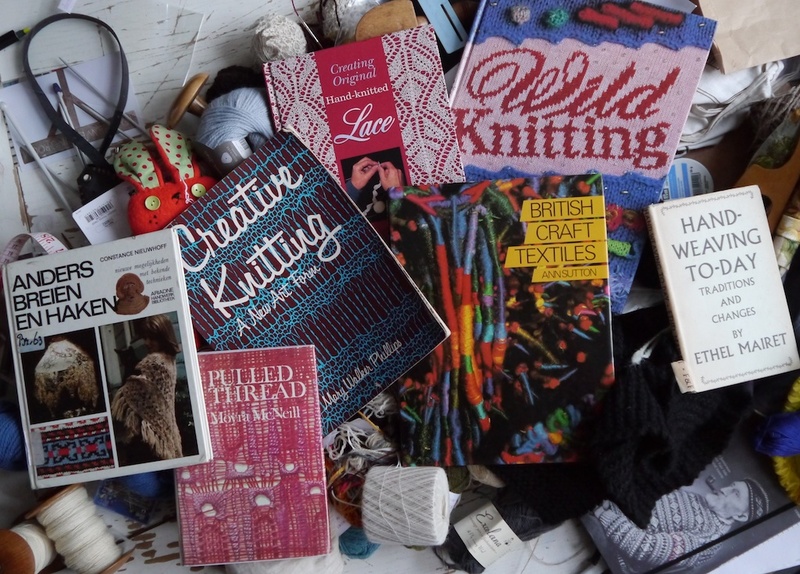 Wild Knitting shows that knitting doesn’t have to stop with jumpers and socks. Margaret Stove shows how to create your own lace patterns, after explaining how lace stitches work together. Moyra McNeill and Constance Nieuwhoff both use traditional techniques in new, sometimes unexpected, applications. Ethel Mairet talks about letting materials and colours speak for themselves, and she often used simple techniques to show these off. It all seems to come together in Mary Walker Phillips’s Creative Knitting. A weaver by trade, she became a very accomplished knitter with a sound knowledge of knitting techniques; she also spins and dyes. She explains how she uses vastly different materials, from artificial straw to handspun linen, and how these have an influence on the techniques she uses. Mostly her art pieces are wallhangings, casement curtains or other lacy structures, incorporating pieces of mica, pebbles, or beads. I find these pieces particularly inspiring at the moment. The lace sample above was a quick study in mixing and matching lace stitches, using handspun Rough Fell 2-ply yarn. 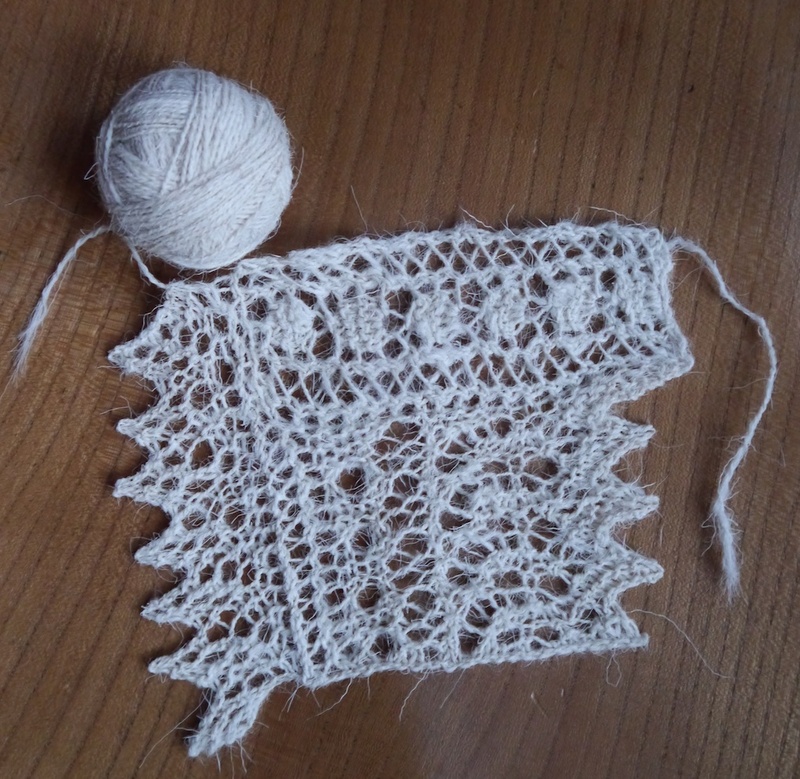 I like the contrast between the kempy, hairy and wire-like yarn, and the lace stitches, which are more usually executed in, for instance, a fine and soft Shetland yarn. This is just a starting point, and I will be creating more samples of both yarn and stitches this year, and be guided by my newfound approach to creative knitting. And in true Rachael-style, I don’t quite know where this will lead me, but I’m excited to start this journey and will be reporting back on my blog. Post-script (added 1 March 2014): perhaps my view on how Rachael appears to create her work was somewhat romanticised and simplified in my head, so please check out the comments on this post below, where Rachael has responded to my writing. So interesting Tom! I particularly appreciated the book references – but the bath mat’s fabulous too, and I really like the idea of lace in new yarns. Thanks for the post! Fantastic post thanks Tom! Greatly taken by the lace. I was just reading a similar post from The Smallest Forest about Uber Embroiderers, and how the most creative often come from another discipline, rather than having been rigorously trained in perfect technique. The joy of the work is in its freedom of application. Thanks for sharing that, it was an interesting read. It’s like the journey is to find the place, and you know where you are going but of course you never know what it looks like until you get there. Unless you were possessed and had no idea where you were heading – which really would be scary!